Next post: Bad weaver, no biscuit! For some reason, I know not why, the problem of breaking threads seems to have solved itself!Â (I suspect it was opening the shed just a little more that fixed it, though I can’t swear to it. )Â Now, instead of a rat’s nest of broken threads, I only have four film canisters dangling from repair threads at the back of the loom.Â That I can handle. As a result, the weaving has gone a lot more quickly, and I wove half a yard today!Â Unbelievable speed, especially considering the fineness of the yarn and the many times I stopped to weave in some of the older broken threads.Â And I feel less exhausted at the end than I did on other days when I wove only four inches.Â It’s amazing how much more pleasant weaving is when you can actually weave! without stopping to fix a broken thread every two minutes.Â And it takes less mental energy…instead of having to concentrate on fixing threads (getting more and more frustrated all the while), you can let go and just groove. I have changed a few things in my weaving technique, and have improved the resulting fabric remarkably by doing so.Â The first change is that I am now advancing every 1/2 to 3/4″, which seems to have eliminated the “breaks” in the fabric altogether.Â Oddly enough, it was not appearing as a “break” across the entire length of the fabric – which I could have expected – but only across certain smaller areas.Â The look was reminiscent of stretch marks on skin. So now, every 1/2 to 3/4″, I reset the temples and advance the warp. The other change I have made is to start holding the beater in the absolute center, instead of on either side.Â I had noticed that theÂ fell (the line where the unwoven warp meets the woven fabric) was quite tilted, with the left side a good 3/4″ higher than the right.Â This didn’t appear to hurt the fabric, but was frustrating me because it really shouldn’t have been happening. I fiddled with various fixes, unsuccessfully, and finally noticed that I was holding the beater slightly on the left side with my left hand and slightly on the right side with my right hand.Â I had figured that would balance out, but obviously something was wrong, so I marked the dead-center spotÂ on the beater, and carefully centered my hand on it with each beat.Â It seems to have worked pretty well – there is still a difference between left and right sides, but it’s down to 1/2″ or less, where it started at nearly an inch!Â Hopefully as I weave on it will get even smaller. Meanwhile, I have been thinking about how to progress on the dressÂ itself.Â I am reluctant to work on perfecting the fit because I am working on losing weight (we’ll see if I actually succeed), and if I drop 20 pounds between now and the wedding, my measurements will change.Â On the other hand, I don’t want to do no work between now and then, either, especially if I’m spending 2-4 months weaving up yardage. So I’ve decided to do some design muslins.Â I have the pattern for the coat, but I haven’t got a firm concept for the dress yet. I’d love to do a strapless gown, except for one small detail: I need to cover up the tanÂ lines on my upper arms.Â Because I’m a cyclist, I’m out in the sun a lot, which gives me major tan lines even wearing SPF 30.Â The ones on my legs I don’t have to worry about, since they won’t be showing, but the ones on my arms will make me look very strange if they aren’t covered up.Â Thus the dithering. A third option is to design my own – what I’dÂ like, ideally, is an off-the-shoulder, princess line dress with no waist seam, and band sleeves – that would be my ideal, but I can’t find a pattern for it anywhere.Â However, I do have pattern design software, which, as soon as I can get myself re-measured, can generate such a pattern for me.Â I’m considering this carefully – it would be a royal pain to piece the pattern pieces together out of 8.5″ x11″ sheets of paper, but it would get the job done. 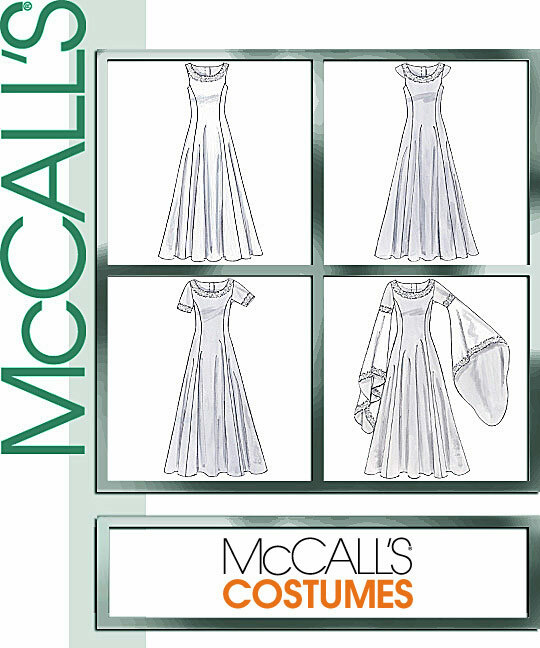 Anyway, the plan over the next 2-4 months, while I’m weaving up the yardage for the dress, is to construct several design muslins, each representing a different style, and try them on.Â For that I’ll also need the yet-to-be-constructed coat muslin, so I can see how the ensemble goes together. I have been reading more of Bridal Couture and it is clear that, for the more complex dresses, there is just as much internal structure as there is in (ahem) a properly tailored coat.Â (Not that I would know anything about that! )Â So once I have the basic style set for the dress, I will probably do up one complete muslin mockup to test out the construction methods outlined in the book.Â This will take awhile, but what the heck – I’ve got at least a year to do it.Â At worst, I can always make the dress the same way I would have before reading the book, and it will still look good.Â I have about 30 AIDS Lifecycle outfits – prom and bridal wear all – to prove that!Â But it would be nice to be able to take my sewing techniques to the next level, so I’ll give it a try. You are doing a wonderful job refining your weaving technique. It is much more effective to learn this stuff yourself than to have someone tell you! Regarding breaking threads. I wonder if they were simply weak areas of the coned thread (that does happen…….). So perhaps you have found them all and there will be no more problems. Hurrah! Designing and losing weight. Make the mockups and learn the techniques for the size you are now. When you’ve lost the 20 pounds it will be very easy to make the alterations. If you measure yourself now and then it will be a piece of cake. Great reading about all of the trials, errors, and fixes. As a weft-faced weaver of rugs/tapestries, I have also had to concentrate on the center beating. The strapless gown with the drape is my favorite–very classy and classic. Not sure if Sharon Alderman mentioned this to you in passing or not. She, very cleverly, put a handle right in the middle of at least one of her beaters so that she is forced to grab it right in the middle. I keep thinking of doing the same thing, for the same reason as you stated, esp. on my 60″ loom. Check out your local print/banner shops most have large printers. Ask what format they want your pattern in and consider having them print it. I know of a local (Portland, OR) designer that has a plotter she prints custom patterns out on. I’d go with the sleeved dress. But maybe I’m missing something. It’s hard for me to imagine how the shoulder wrap would work with the coat. Would you wear three layers? Take off the coat and slip on the shoulder wrap? WRT upper-arm tan line: long gloves? or maybe (semi-)detached sleeves?